The Grid view shows all the Examples arranged in rows and all the Input/Outputs arranged in columns. The first column contains the Example types and names. The first row contains the Input/Output types and names. Everything on the Grid can be edited by moving to the cell containing the value and then pressing the enter key to start the Edit Grid dialog. The cell can be selected either using the arrow keys or the mouse. A single click will select the cell and a double click will start the Edit Grid dialog. A double click on the Example name cell will select the whole row and a double click on the Input/Output name cell will select the whole column. The row or the column can be deselected by pressing the Esc key. A new Grid is created by pressing the new toolbar button or using the File > New menu command. The new Grid will be empty except for a horizontal line, a vertical line and an underline marker that shows the current position in the Grid. New Grid rows and columns are created at the current position. Press return and a prompt will appear that says "Create new Example row?". Answer Yes. Another prompt will appear that says "Create new Input/Output column?". Answer Yes again. You will now see that the Grid has one cell containing "? ", a row name containing "T:0" and a column name containing "I:0". The "?" 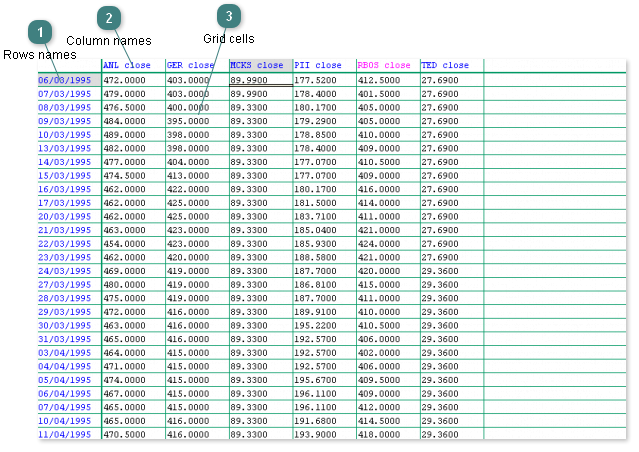 indicates that the cell has no value, the "T:0" indicates that it is a Training Example in row 0 and the "I:0" indicates that is is an Input in column 0. Press return again and an Edit Grid dialog box will appear that allows you to enter the cell value. Using the same dialog you can change the Input/Output column name, mode and type. The dialog can also be used to change the Example row name and type. Move the marker one cell to the right by pressing the right arrow or tab key. Now press the return key and a prompt will appear that says "Create new Input/Output column?". Answer Yes. Press return again and the Edit Grid dialog box will appear. This time the Example row will already contain a name and type. You can set the cell value, the Input/Output name and the type can be set to "I:" for input, "O:" for output, "X:" for exclude or "S:" for serial. The mode can be set to "Real", "Integer", "Bool" "Text" or "Image". Any type of Input/Output column can be inserted into the Grid using the functions on the Insert menu. Move the marker one cell down by pressing the down arrow key. Now press the return key and a prompt will appear that says "Create new Example row?". Answer Yes. Press return again and the Edit Grid dialog box will appear. This time the Input/Output column will already contain a name and type. You can set the cell value, Example name and the type can be set to T: for training, V: for validating, Q: for querying or X: for exclude. Any type of Example row be inserted into the Grid using the functions on the Insert menu. Copying Example rows and Input/Output columns. Double click on the name to select the whole row or column. Cut will remove the selected row or column and place it on the clipboard. Copy will place a copy of the selected row or column on the clipboard. Paste will insert a copy of the clipboard before the currently selected row or column. If the clipboard contains a row then Paste will insert the row into the Grid. If the clipboard contains a column then Paste will insert a column into the Grid. The invisible Grid data, limits and defaulted values, will be regenerated after a Paste column thus any neural network that has already been generated from the Grid will be invalidated. The grids rows can have any names. If names are not used the rows are numbered. The grid columns can have any names. If names are not used the columns are numbered. Grid cells can contain numbers, text or images. The numbers can be integer, real or boolean.